Made of 100% spring crimped nylon material. It will not fade, bunch, weather or leave marks on your clubs.The mat is 1.250" thick with a urethane backing that will withstand repeated abuse. You do not need special rubber tees. No more hitting off of a predetermined height of a rubber tee. 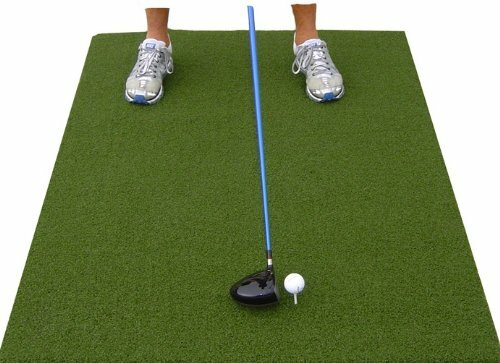 Our mat will accept a real wooden tee which allows you to choose different clubs you want to hit at different heights. Rubber tees also give you a different feel because they obstruct your club at impact. Our mat gives you that on the course feel. Our dense fiber mat allows you to feel the difference on a fat shot because if you go to deep the thick fibers will slow your clubhead speed resulting in a fat shot. In practice you will learn to eliminate your mishit shots. Our competitors golf mat will spring off the turf into the ball which will result in mishit shots. Our mat lets you hit down on the ball for better practice.